Can a sharing model based on free/pay-what-you-want resources be sustainable over a long period of time? One of my assistants e-mailed me about my difficulties with delegation. He suggested thinking of my life as a business: What would my objectives be? When I reflected on that, I realized I had some discomfort around the ideas of customers and business models. Was my life more like science and exploration? Not quite, either. I left the thread of thought unresolved. Problogger posted this mind map of different ways to monetize a blog. I realized that I’m not keen on advertising, physical products, selling/flipping blogs, premium content/communities/products, affiliate marketing (except for books I like, and even then those offer tiny commissions and it feels a little hypocritical to do that given that I hardly ever buy books myself), and other indirect methods. I might be okay with coaching, if I can come up with a good workaround for the impostor syndrome. In an interview about Quantified Self and life experiments, a journalist asked me to describe my business. I felt that social business consulting wasn’t the real crux of my current life’s work, and that talking about writing and publishing e-books would be incomplete without exploring why free/pay-what-you-want pricing is important to me. Answering his question prompted me to think about my motivations a bit more. Harold Jarche wrote about the exposure economy and his decision to limit his sharing. I understand where he’s coming from – by mom gives similar lectures to aspiring photographers who have yet to internalize that “exposure” won’t buy them new equipment. But there’s something else that drives me to share more, not less, and I want to understand that. @ljconrad retweeted a link to The Gift of Being Uncommon, which included a segment on “gift reciprocity versus market economy.” It says that people “may have difficulty charging sufficiently for their work, especially if they view their own abilities, products or insights as gifts that need to be shared with others.” I’ve requested Lewis Hyde’s book The Gift: Creativity and the Artist in the Modern World from the library, and I’m looking forward to digging into it further. The contrast of a gift culture versus a market economy reminded me of Eric S. Raymond’s “Homesteading the Noosphere” (2000). I revisited its sections on gift culture, art, and reward. It made me think: Is reputation a major driver for me? How does this work out if my ideal outcome does not involve parlaying that reputation into economic opportunities like jobs or gigs? And that reminded me of Tom Morkes’ guide to pay what you want pricing, and the breadth of people using the PWYW strategy. I’m always delighted to get a note from Gumroad that someone has purchased one of my resources, but I’m still working on getting my anxious side to accept that this is okay. Mulling all those things, I realized that the model I can use to understand my desire to share isn’t business (with its customers, markets, and exchanges of value) or modern science (with its funding from institutions and competition around publications). It’s philosophy. 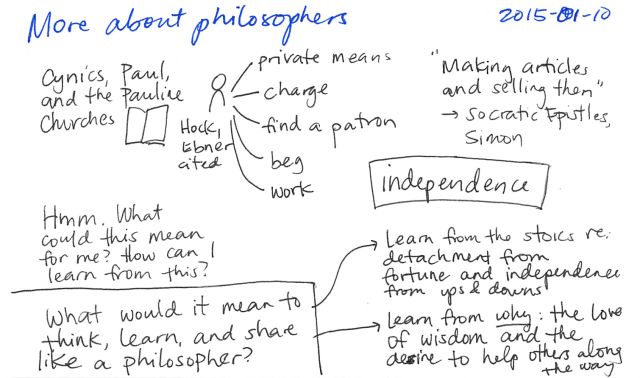 Ancient philosophy, not professionalized modern philosophy. 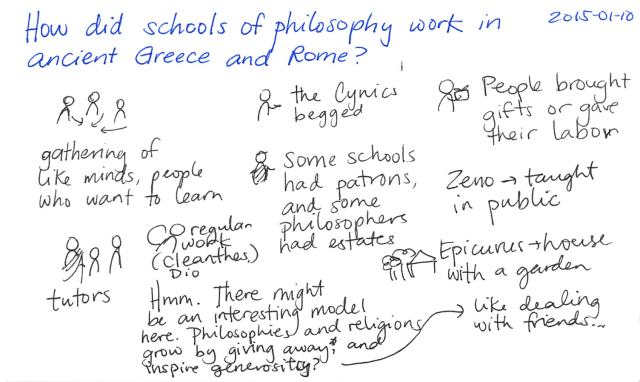 What were the “business models” for ancient Greek and Roman philosophers? How did they sustain themselves? People or schools received gifts (from students, from other people in the community, etc.). People or schools had rich patrons. People charged tuition, offered private tutoring, and so on. People worked in unrelated occupations. For example, Cleanthes philosophized during the day and carried water at night. People had private means: estates, investments, and so forth. Seneca had a fortune (acquired through less-palatable means). Atticus inherited wealth and grew it through real estate. Some philosophers taught in closed schools: Pythagoras kept an exclusive brotherhood. Others taught in public, like Zeno did. I can grow from the conversation. This last point is particularly important to me. I’m still figuring things out. I don’t feel that I’m quite at the stage where I can teach people well – when I have clear paths and well-tested lessons. I’m still at the stage where I try to live as well as I can, making and sharing useful things. People’s questions often help me realize something I didn’t know I knew. I’m nowhere close to sharing wisdom suitable for the ages (and might never be). With that learner’s perspective, it doesn’t make sense to me to limit the circle of people I can reach, or to charge people for the privilege of my being able to learn from them. But it does make sense to be open to gifts – of money, sure, but especially of time, skills, experience, and perspective. In fact, reflecting on how ancient philosophers managed their ups and downs helped me address more of my anxiety over whether a financial mistake might break this freedom. After all, life back then was way more volatile than life is now. 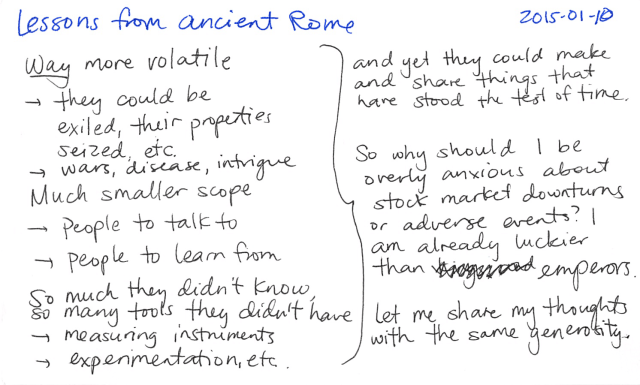 What’s a downturn in the stock market like compared to the whims of emperors and the possibility of exile? I have fewer pressures on my life and more resources than people back then could imagine. (Searchable books! The Internet! Amazing text editors! Boggle.) If I want to learn about interesting things, potential changes in my situation shouldn’t stop me. So here we are. I don’t know if Kevin Kelly is right about 1,000 True Fans (or John Scalzi about a larger, more modest base). “Fan” isn’t quite what I’m going for, anyway. I want co-adventurers, co-figure-out-ers – ideas bumping into each other in conversations, the back-and-forth of experiments. Maybe a teacher will appear and guide me. 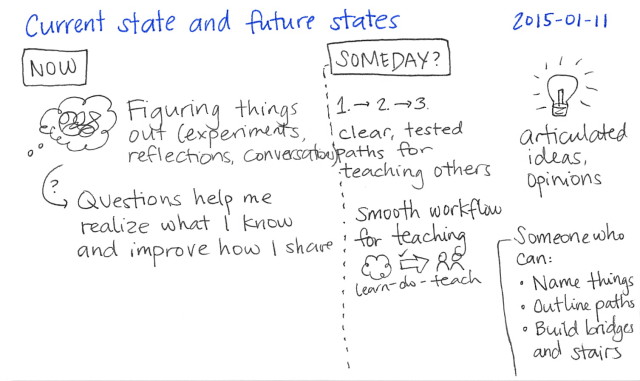 Maybe students will help me discover what I can teach. I’ve found some role models to help me understand sharing, and I’m looking forward to seeing if that can still work in the modern world – or better yet, what we can do with it.